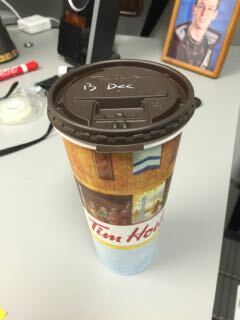 I suspect almost anyone who sees that image would parse it as a date, that is “13 December”. Of course, once you see it in context, at least the Tim Horton’s regulars would know it said “Black Decaf”. Deb and I stopped by Mati Sauks’ birthday party at Tailgators for a while tonight. 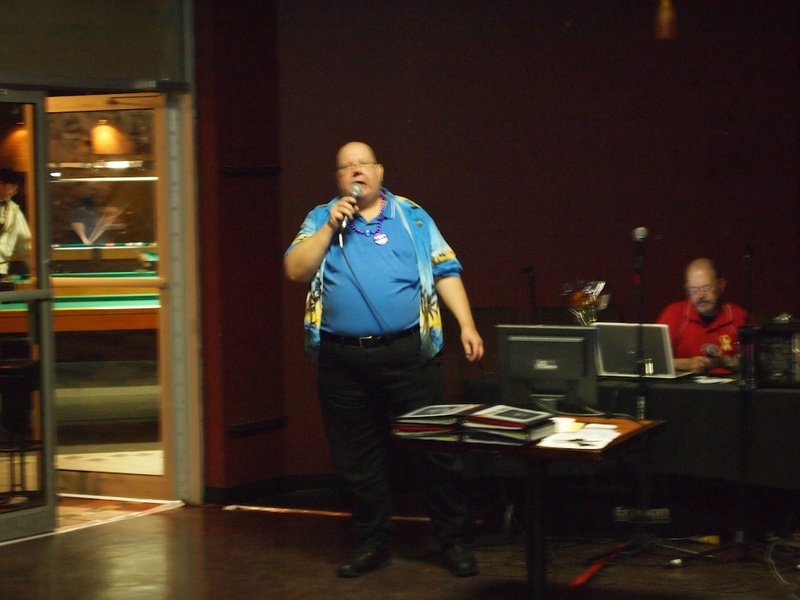 Here’s a shot of Mati doing Karaoke, which proves that the good ones never forget how to party. Some of you probably already know I’ve been looking at replacing our 2002 Protege 5. The car has been (and continues to be) fun to drive, but like most of the Proteges from that model year it is rusting away to nothing. (Ask me about the time the floorboards rusted to the point where I put my foot through onto the road.) Really, when you start worrying about whether or not it’s hazardous to continue driving a car, it’s time to get rid of it. Because Deb and I have two vehicles that are both getting on in years, we need to bound our enthusiasm for the Protege replacement (i.e. “my” car) so that we can afford to pay for whatever we get to replace Deb’s Honda Odyssey (sometime in the next 2..3 years). Her requirements are quite different than mine, since she often needs to drive long distances on the highway, carrying huge volumes of wool and related gear, as she goes to trade shows in support of her business. For those who haven’t actually driven a Golf lately, this is not your father’s Rabbit. I was looking at the model with the standard gasoline engine, which is a 2.5 litre, in-line 5 cylinder engine that produces 170(!) horsepower. Even during the test drive, I had no trouble getting a 0..100 K/h time under 8 seconds. By comparison, the diesel engine model was not quite as powerful, but made up for it by having a ton of low end torque. Overall, the car was Mercedes-level quiet, had responsive, flat handling and excellent features. My only significant complaint was that it still has the vaguely cheap feeling, plastic interior trim that I remember from VWs past. In any case, if you like driving, this is an excellent choice. Unfortunately, they’ve ended up at a price point (>$28K, as tested) that doesn’t fit in my budget. I was looking at the GLS trim level with the 5 speed manual transmission. There is a GLS “Sport” version with larger alloy wheels that is more expensive, but that one is close enough to the Golf in price that it wasn’t a contender. This car is definitely the largest of the bunch, with lots of interior cargo space even when the back seats are not folded down. I found it to be unexpectedly fun to drive, but not in the same class as the VW, and it was somewhat noisier — not unacceptably so, but noticeable. I’m fairly certain I could be happy with this one. It clocked in around $23K. The Fiesta is a new design for this model year, with an interesting, aggressive, European look. It is clearly aimed at young people who want a sporty driving experience for a reasonable price. It’s faster than the Elantra, approximately the same in terms of noise levels, and much, much smaller. Size, in particular, is the downfall for this one. The back seats do not seem to be usable by adults, and it only passed the “will hold a cello” test by the narrowest margin. However, it was inexpensive (approx. $20K) and handled well enough that it would probably have been first pick if I didn’t know that I sometimes still need to carry Deb, Dennis and a load of groceries. 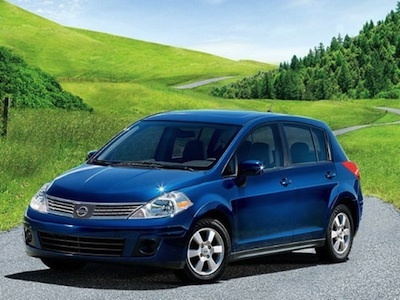 The Versa is Nissan’s entry in the sub-compact field. As such, it’s competitors are vehicles like the Honda Fit, Toyota Yaris, Chevrolet Aveo, etc. Compared to these, the Versa is the obvious winner. It’s is the largest (easily seating four adults), the quietest, and has every feature you could imagine in a car that cost less than $18K. We’re talking keyless entry, power locks and windows, cruise, 6-way adjustable driver’s seat, a decent audio system (CD changer, iPod connector, speed-sensitive volume control, etc. ), anti-lock brakes, traction control… Heck it even holds my cello better than Fiesta. As is often the case with these kinds of decisions, it was really only the end points that turned out to be interesting. In a world where we weren’t going to buy another vehicle in a couple of years, the Golf would be the hands down winner. I had more fun test driving it than I’ve had since I was in Kevin’s BMW. Unfortunately, $28K is just too much for a “second” car. The Hyundai was still too much for what you got; the Fiesta was too small. 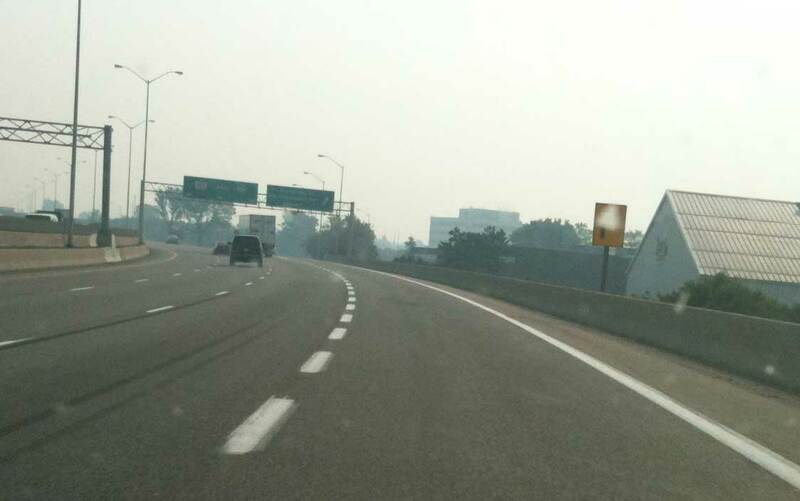 Update: The air quality index for Ottawa was 132 (== very poor) today. Normally, at this time of the year, it’s around 30. 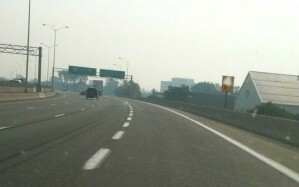 Today is not a good day to be doing outdoor excercise. Ok, so the story isn’t deep — seriously, the guy beside me in the theatre brought a four year old and a six year old and despite the disturbing parenting choice they both “got it” just fine. And even though the er… avatars didn’t quite make it out the other side of the uncanny valley, they were close, oh so very close. I can honestly say that there were many scenes where it never even occurred to me to think about how long it would have taken to render. You owe it to yourself to go see this in 3D. Even if it doesn’t seem like your kind of movie, the sheer artfulness of it is enough. Afterwards, leave a comment. There are things worth discussing. Update: There are likely to be spoilers in the comment stream, so if you haven’t seen the movie yet, don’t click through. I am an avid listener to CBC Radio 1. It wakes me every morning, and is on almost exclusively when I’m driving — the only exception being when Dennis wants to listen to the U.S. driven, R&B, pap[*] that Hot 89.9 puts out. It is also the only station that I have ever made the requisite effort to be listening to at a specific time in order to catch a particular program of interest. Ideas is a program about contemporary thought. It explores social issues, culture and the arts, geopolitics, history, biography, science and technology, and the humanities. … but this typically Canadian understatement hardly does it justice. By turns Ideas can be enlightening, frustrating, shocking, heart warming, awe inspiring, disgusting — the gamut of human potential. I have learned more in a week of listening to Ideas than I have in some university courses. Of course, the show is not easy listening. It requires real engagement on your part, and depending on the subject matter, may be a dry slog. It’s worth sticking with it, though. In this world of focused specialization and heads-down scrambling through the immediacies of life, it is wonderful to be reminded that there is a bigger picture, and we’re all part of it. If you’re looking for Ideas, their site has broadcast times and show notes. CBC1 can also be streamed over the net if you can’t find some other way to get there. If you want just a taste of Ideas, you can subscribe to their “best of” podcast on iTunes. Unfortunately, there doesn’t seem to be a podcast of all episodes. It’s too bad, really; that’s one that would definitely be on my iPhone. I was listening to CBC1 this morning and heard a review of a movie called “Ben X” that’s coming to the Bytown (Flemish with English subtitles). The movie starts Friday and runs until July 3. I’m probably going to go, so ping me if you’re interested and want to coordinate. I am an avid CBC Radio 1 listener, and as such, I have heard pieces of the CBC program “WireTap” somewhere around twenty times now. In all those times, the longest I have ever been able to convince myself to listen to the show was about five minutes. I honestly can’t imagine how such blecherous dreck ever got the green light, let alone how it can continue to be aired. It is essentially a half-hour of incoherent, neurotic rambling, of the sort that you would barely put up with if it was being generated by someone you cared about. In this case, the host is one of the singularly most unlikeable on-air personalities since Kenny versus Spenny, so the only possible reaction is to leap for the channel change dial. Please, CBC, kill this show. It single-handedly lowers the quality of your entire station to the level of “crappy audio-blog”. To my eye, it seems like there is a distinct lack of forthrightness here on the part of either the board, the original person requesting the “review” or both. The fact that nobody involved is willing to discuss why the review was requested seems like an obvious attempt to deflect the natural criticism that this situation would engender. And it’s clear what the situation is: The Golden Compass specifically targets the myths of Christianity and inverts them, providing a clear “what if” scenario that, heaven forbid (sic), might actually cause young people to think about their beliefs. Well, we can’t have that! It’s time for us to realize, as a species, that ignorance is never the answer. By all means, talk to your child about the books. Remind him that they are fiction. Heck, if you’re feeling especially daring, discuss whether the world would be significantly different if what the books describe were real. Whatever you do though, don’t hide the books from your kids. If their faith is so fragile that The Golden Compass can disrupt it, then perhaps there’s a bigger picture you need to be considering. Voting is better than a lottery. Every time you vote, you help lead your land. Almost every time you buy a lottery ticket, you’ve thrown your money away. * overheard on the way to the polling station tonight.